Description: A group of talented Fallanasi practitioners, able to unite their minds and skills to use their talent to aid the Mandalorian Empire. After attempts at creating stealth fighters and other stealth craft for the Mandalorian Empire, General Kaine had reached an impasse, where technology could take their purpose little further. Upon dealing with the skilled, capable and dangerous Baiko No Kaho, Fallanasi practitioner, Kaine became aware of a very different and very powerful method of cloaking a vessel and its crew. The approach, however, was not easy. It took months before Kaine was able to convince a single Fallanasi adept to even hear him out. In time, by acting with integrity and honesty, and by proving with his deeds that his words were not hollow, others were eventually convinced to give the concept their effort. Finally, a group of twelve adepts was collected, and so they made their pact with the Mando'ade. 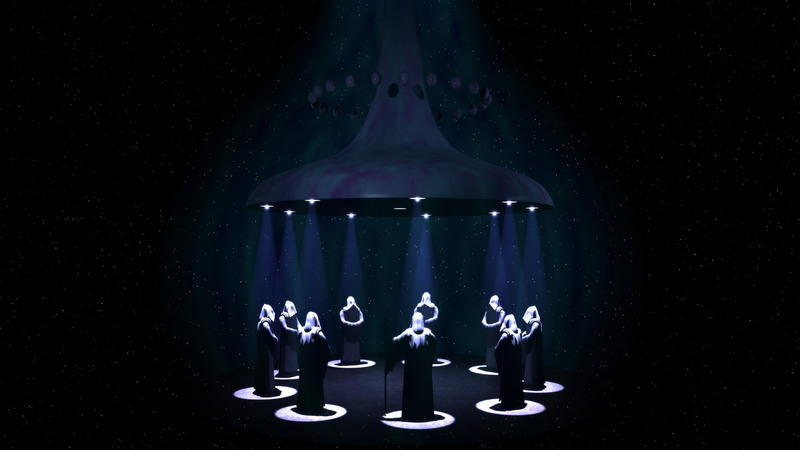 The adept chamber contains a neural interface, allowing up to twelve Fallanassi to link their minds as one. Should one mind be overwhelmed it can be disconnected from the collective consciousness, to avoid neural shock. If the interface is damaged in any way due to power overload or other external force it will be disabled to prevent injuries to the Adepts using their Talent. The main use of this talent is to cloak the carrier named Black Star in an illusion, capable of defeating sensor and sense alike. Such a talent when utilized by several adepts working together is extremely difficult to detect. Only a skilled practitioner of the Force, familiar with Fallanasi techniques, or an Adept of the White Current, would be capable of even sensing that something in the vicinity was hiding, let alone what it was. Someone extremely strong in the Force, an experienced Master, would be able to sense that something in the vicinity was "wrong" somehow, or "not right" but nothing specific beyond that something might be trying very hard not to be seen. Seeing that something is definitely hiding would require knowledge of Fallanassi techniques or actual practice with the White current. Only a concert of Fallanassi would be able to overwhelm the Adept Circle's manipulation of the White Current and fully penetrate the illusion. A solemn pledge was extracted from Kaine, that not only would the vessel not have any offensive weapons, but that it would only be deployed in the most dire of circumstances against the most evil and pernicious of enemies. Kaine agreed wholeheartedly, not wanting to disrespect the Fallanasi tradition of non-violence, and humbled that they would go even so far to aid the Mando'ade. This tradition is heavily enforced throughout the ship, with weapons kept under guard, and well away from visibility, concentrated only in the hangar bays. Empowered with such a monumentally exotic method of cloaking their unique vessel, the General, though diplomatic skill and patience, with the assistance of his new Fallanasi brothers and sisters is able to provide the Mandalorian Empire with a near invisible carrier, capable of matching anything the galaxy had to offer. Edited by Kaine Australis, 19 June 2018 - 01:54 AM. Absolutely no combat abilities whatsoever, completely pacifist. Could you please expand a little further on these strengths & weaknesses? Also add two more for each, if possible. Arekk My apologies, between State of Decay 2 and the World Cup i've been remiss in my duties. I will fix this up within 24 hours. Arekk Ok all fixed up. Kaine Australis - I enjoyed reading the sub and the out of the box thinking, just a few things to really complete the submission. 1) The Neural interface - does something happen if one or more of the Fallanassi is compromised? Please expand further on this, also any particular reason they would participate in cloaking the ship even though its not weaponized. The wording sounds contradictory especially since this ship would be transporting / possibly participating in combat. Can you elaborate further? Since the Ship will be used with the Mandalorian Empire, can you please link affiliation to them. 3) This does seem over powered by the ability that they are using, you can only "see" through if someone knows the white current. Its a good thought, but as of right now I do not feel comfortable approving it. I'm currently mulling over what and how we can balance something like this. Edited by Allyson Locke, 19 June 2018 - 01:11 AM. Allyson Locke No worries, i've expanded on the neural interface and the ways someone might detect the illusion or even penetrate it. Thank you. I've been doing my own research on White Current as well. Concern: What is the intended use of this ship? What sort of crew will be on it? Basically what are they protecting and why are they willing to protect it. Edited by Allyson Locke, 19 June 2018 - 02:19 AM. Allyson Locke The ship itself is crewed by handpicked Mando'ade sworn to secrecy, its a black project, and only ever to be deployed in the direst of circumstances against the most insidious evils, otherwise the Fallanassi would not assist in cloaking the vessel. That was the crux of how Kaine got them to agree to go even so far as to cloak a warship. As they see it, they are utilizing their talent to protect and conceal an unarmed ship, which carrys aMandalorian Force that will be leaving the ship andfighting evil, and thus they are okay with toeing the pacifist line in such a way. They took some convincing which is why Kaine was only able to get twelve to join up, and only with serious caveats on when they will participate. Luke Skywalker used this talent to cloak the Fondorean fleet from Darth Caedus during the Second Galactic Civil War in legends, which is where i got the idea. Edited by Kaine Australis, 19 June 2018 - 02:24 AM. That was the crux of how Kaine got them to agree to go even so far as to cloak a warship. As they see it, they are utilizing their talent to protect and conceal an unarmed ship, which carrys a Mandalorian Force that will be leaving the ship and fighting evil, and thus they are okay with toeing the pacifist line in such a way. They took some convincing which is why Kaine was only able to get twelve to join up, and only with serious caveats on when they will participate. This was what I had figured was the concept of it. Basically with the White Current, you're making a ship that cannot be targeted and completely invisible. Even if someone can see through the current, that doesn't mean a ship or planetary defenses can even fathom targeting it because the white current makes things completely undetectable. Because it can't be targeted by a ship or any sort of defenses - even if seen, the ship is basically free to do what it wants, IE: Drop a whole mando force onto a planet without any hiccups or issues. This was my number one one concern and because of this I'm going to have to deny this on concept. You are more than welcomed to second chance it, but it will need serious rework possibly removing what makes this submission unique. Edited by Allyson Locke, 19 June 2018 - 02:41 AM.